- Optional off-board GPS, uBlox NEO-6M module with Compass. - One of the first open source autopilot systems to use Invensense's 6 DoF Accelerometer/Gyro MPU-6000. - Barometric pressure sensor upgraded to MS5611-01BA03, from Measurement Specialties. - Atmel's ATMEGA2560 and ATMEGA32U-2 chips for processing and usb functions respectively. This is the new APM 2.6 autopilot module. 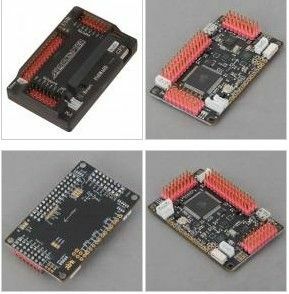 The sensors are exactly the same as with APM2.5+, however this version does not have an onboard compass, which makes this version ideal for use with multicopters and rovers. The APM 2.6 is a complete open source autopilot system and the bestselling technology that won the prestigious 2012 Outback Challenge UAV competition. It allows the user to turn any fixed, rotary wing or multirotor vehicle (even cars and boats) into a fully autonomous vehicle; capable of performing programmed GPS missions with waypoints. Available with top or side connectors. This revision of the board has no onboard compass, which is designed for vehicles (especially multicopters and rovers) where the compass should be placed as far from power and motor sources as possible to avoid magnetic interference. (On fixed wing aircraft it's often easier to mount APM far enough away from the motors and ESCs to avoid magnetic interference, so this is not as critical, but APM 2.6 gives more flexibility in that positioning and is a good choice for them, too). This is designed to be used with the 3DR uBlox GPS with Compass (see option below), so that the GPS/Compass unit can be mounted further from noise sources than APM itself.